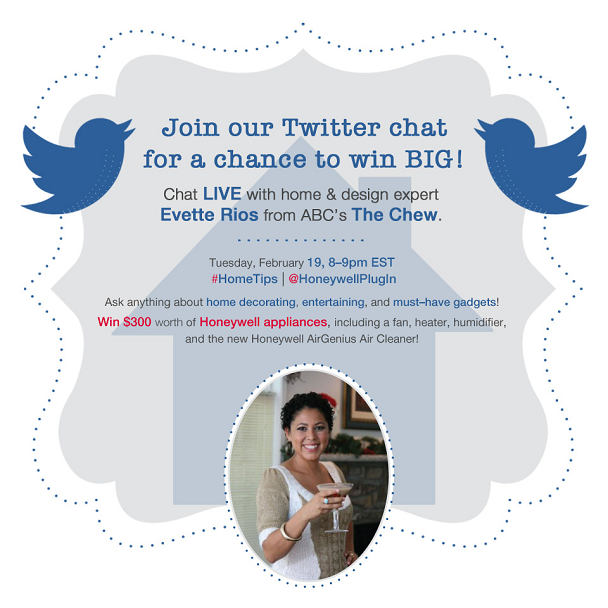 Join @HoneywellPlugIn on Tuesday, 2/19, at 8-9pm EST for a Twitter Chat with home & design expert Evette Rios from ABC’s The Chew. Ask Evette questions in real time and get the advice you need on decorating, entertaining and more– including a chance to win $300 worth of Honeywell gadgets! Use hashtag #HomeTips to join in. For a chance to win the Honeywell AirGenius 5 Air Cleaner, go over and visit my friend Kate at The Guavalicious Life. In accordance to the FTC Guidelines and the WOMMA Code of Ethics, I am disclosing that no compensation was received in exchange for this post. Honeywell is providing the prize for my readers. As usual, all opinions are my own. What types of house plants are easy to take care of? Is it safe to use a humidifier in a newborns room daily? What are easy ways to freshen your house in the winter? where is the best place to have a humidifier in your home? Do home humidifiers need to be used with distilled water? I have well-water and it is very 'hard'. I have a question about the Honeywell Germ-Free Cool Mist Humidifier, does it actually cool off the room on a hot day? how long does it take for a humidifier to work? How can I get the smell of smoke to go away? I missed the chat but I'm also wondering about the smoke smell. how do you keep mold and mildew from forming in the humidifier? can you add essential oils to any humidifier? What is the best design to pick for a kitchen. I want something that is timeless. Any advice for keeping a house with dogs and cats smelling fresh? It seems to be a constant battle for me. should use a cool mist or warm mist and when? I'd like decorating tips to make a home both attractive and practical. My dorm room isn't that big. Would a humidifier be okay for a dorm room? How can I freshen a home that constantly smells like cat? I have tried everything from Febreeze to candles.